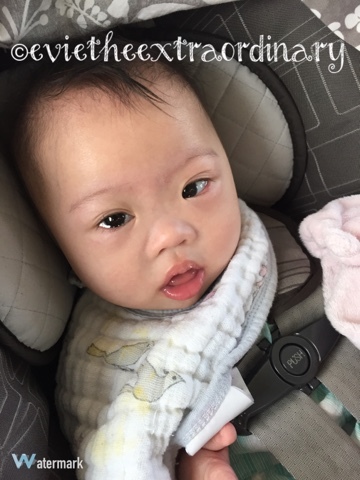 Evie the Extraordinary and Her Mommy: The Journey As We Go: First Eye Exam! I am behind in blogging because I went back to work full-time 2 weeks ago. But I can't not blog about Evie's first eye exam! 5) Put in dilation eye drops for the ophthalmologist to assess the back of her eyes. 1) Generally, an eye exam for a baby goes pretty quickly. You don't have much time with their short attention spans. The doctor will wave lots of lights in front of your baby, make lots of noises, and generally try to keep their attention. The orthoptist waved spinning lights and fun toys that made sounds, and put a sticker on her nose. Evie followed all of the targets she presented. Score 1 for Evie! 2) Next she shined a light into Evie's eyes to check her pupillary reflexes, and held prisms of different amount of power (optical power, not supernatural power!) in front of her eyes to see if her eyes moved while looking through the prism. All of this was to check for large amounts of an eye turn. The orthoptist and the doctor did a cover test with their thumb. By covering and uncovering (and then alternating) Evie's eyes, they could look for any resulting eye movement indicating an eye turn. Evie does have a small alternating intermittent eye turn inwards. This means that sometimes one of her eyes will turn in, and it alternates between the two eyes. Nothing is needed right now for treatment--she may even grow out of it. Eye turns are treated with glasses, eye patching, and sometimes surgery. Evie needs none of those for now. 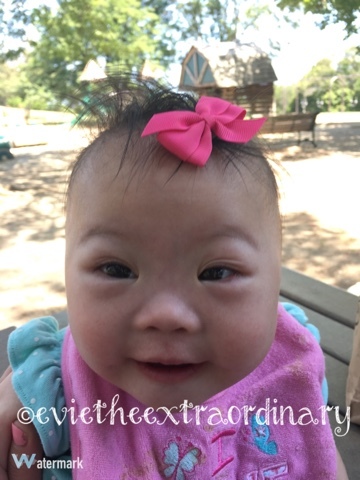 Not only is Evie a kid with no nasal bridge, but she also is Asian. This makes for huge epicanthal folds, which are the extra skin on the nasal side of the corners of her eyes, which enhances the appearance of an eye turn. Babies usually grow out of this. I love you, little button nose! 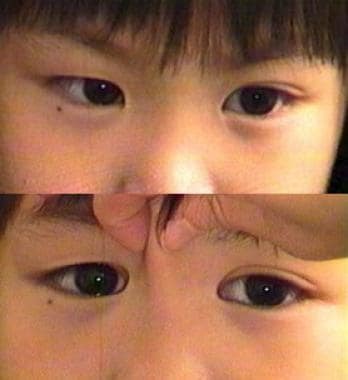 You can see that the eye turn looks lessened when the skin of the epicanthal fold is pinched together. 3) Next, the flashing lights and fun toys were back, except they came at Evie from the periphery, and each time she turned her head to look at them. This checked her peripheral vision.That's my girl! 4) How the heck do you measure a baby's vision? They can't read letters! Glad you asked. These are Teller acuity cards. They have lines on one side of the card of different thicknesses and spacings. 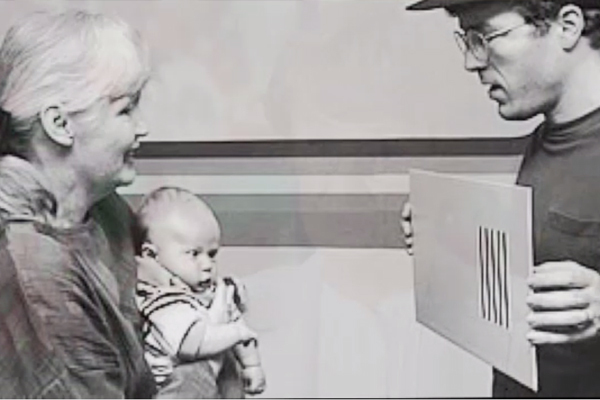 If the baby looks at the side of the card with the lines, this indicates that they can see these lines. The lines get finer and harder to see. Evie saw quite well at 20/80 with both eyes. The fact that Evie saw equally between the two eyes is important (and not so much the numbers), because she often appears to have an eye turn. If one eye had seen less than the other eye, she would have needed an eye patch to help the other eye to learn to see better. This is one of the main things that an eye doctor will look for--a significant difference between the two eyes. 5) As a baseline eye exam, a child will typically get eyedrops during their visit to make their pupils bigger so that the doctor can get the full extent of their prescription (to see if they should have glasses), and to check the health of the inside of their eyes. Kids with Down Syndrome sometimes have a hypersensitivity to certain eye drops used to dilate the eyes. The drops that have a warning with them for Down Syndrome are Atropine, and to a lesser extent Cyclopentolate. Because of Evie's heart and lung problems, I stopped the orthoptist from using Cyclopentolate, which is a pretty standard dilation drop for kids, and politely asked her to check with the ophthalmologist. She did so, and came back telling me that the ophthalmologist told her that was a good question. So we just used Tropicamide, which has no risk of hypersensitivity with Down Syndrome. These drops can sting and burn a bit, but Evie only cried for about 30 seconds. I am not saying that all parents should say no to Cyclopentolate, because it offers very useful information for the potential need for glasses. If Evie had not had a history of a heart and lung condition, I might have considered dilating with Cyclopentolate. Overall, Evie's eyes looked great. No cataracts either (which Mommy already knew). Some watery eyes because Evie's facial anatomy with DS makes for narrower tear drainage channels, but hopefully she'll grow out of that. Great job, Evie! Mommy is so proud of you! P.S. Optometrists can also confidently assess children's eyes! It's best to get a baseline eye exam for your child by age 3, so anything abnormal about their visual development can be caught early. I remember my first eye check up while reading this post.